Important advances in the history of anesthesia changed the specialty forever. Humans have inhabited the Earth for 200,000 years, yet the discovery of surgical anesthesia was a recent development in 1846. For thousands of years most surgical procedures were accompanied by severe pain. The only strategies available to blunt pain were to give patients alcohol or opium until they were stuporous. In the 21st Century, modern anesthesiologists utilize dozens of medications and apply sophisticated high-tech medical equipment. How did our specialty advance from prescribing patients two shots of whiskey to administering modern anesthetics? In chronologic order, my choices for the 11 most important advances in the history of anesthesia follow below. I’ve included comments to expound on the impact of each discovery. 1846. THE DISCOVERY OF ETHER AS A GENERAL ANESTHETIC. The first public demonstration of general anesthesia occurred at Harvard’s Massachusetts General Hospital in Boston, Massachusetts. Dr. William Morton, a local dentist, utilized inhaled ether to anesthetize patient Edward Abott. Dr. John Warren then painlessly removed a tumor from Abbott’s neck. Comment: This was the landmark discovery. From this point forward, painless surgery became possible. 1885. THE DISCOVERY OF INJECTABLE COCAINE AND LOCAL ANESTHESIA. Cocaine was the first local anesthetic. Dr. William Halsted of Johns Hopkins University in Baltimore first injected 4% cocaine into a patient’s forearm and concluded that cocaine blocked sensation, as the arm was numb below but not above the point of injection. The first spinal anesthetic was performed in 1885 when Dr. Leonard Corning of Germany injected cocaine between the vertebrae of a 45-year-old man and caused numbness of the patient’s legs and lower abdomen. Comment: The discovery of local anesthesia gave doctors the power to block pain in specific locations. Improved local anesthetics procaine (Novocain) and lidocaine were later discovered in 1905 and 1948, respectively. 1896. THE DISCOVERY OF THE HYPODERMIC NEEDLE, THE SYRINGE, AND THE INJECTION OF MORPHINE. Alexander Wood of Scotland invented a hollow needle that fit on the end of a piston-style syringe, and used the syringe and needle combination to successfully treat pain by injections of morphine. Comment: The majority of anesthetic drugs today are injected intravenously. Such injections would be impossible without the invention of the syringe. 1905. DISCOVERY OF THE MEASUREMENT OF BLOOD PRESSURE BY BLOOD PRESSURE CUFF. Dr. Nikolai Korotkov of Russia described the sounds produced during auscultation with a stethoscope over a distal portion of an artery as a blood pressure cuff was deflated. These Korotkoff sounds resulted in an accurate determination of systolic and diastolic blood pressure. Comment: Anesthesiologists monitor patients repeatedly during every surgery. A patient’s vital signs are the heart rate, respiratory rate, blood pressure, and temperature. It would be impossible to administer safe anesthesia without blood pressure measurement. Low blood pressures may be evidence of anesthetic overdose, excessive bleeding, or heart dysfunction. High blood pressures may be evidence of inadequate anesthetic depth, or uncontrolled hypertensive heart disease. 1913. DISCOVERY OF THE CUFFED ENDOTRACHEAL BREATHING TUBE. Sir Ivan Magill of England developed a technique of placing a breathing tube into the windpipe, and endotracheal anesthesia was born. Dr. Chevalier Jackson of Pennsylvania developed the first laryngoscope used to visualize the larynx and insert an endotracheal tube. Drs. Arthur Guedel and Ralph Waters at the University of Wisconsin discovered the cuffed endotracheal tube in 1928. This advance allowed the use of positive-pressure ventilation into a patient’s lungs. Comment: Surgery within the abdomen and chest would be impossible without controlling the airway and breathing with a tube in the trachea. As well, the critical care resuscitation mantra of Airway-Breathing-Circulation would be impossible without an endotracheal tube. 1940. THE DISCOVERY OF CURARE AND INJECTABLE MUSCLE RELAXANTS. Dr. Harold Griffith of Montreal, Canada injected the paralyzing drug curare during general anesthesia to induce muscular relaxation requested by his surgeon. Although the existence of curare was known for many years (it was an arrow poison of the South American Indians), it was not used in surgery to deliberately cause muscle relaxation until this time. Comment: Paralyzing drugs are necessary to enable the easy insertion of endotracheal tubes into anesthetized patients, and paralysis is also essential for many abdominal and chest surgeries. 1950’s. THE DEVELOPMENT OF THE POST-ANESTHESIA CARE UNIT (PACU) AND THE INTENSIVE CARE UNIT (ICU). The shock and resuscitation units organized during World War II and the Korean War resulted in efficient care for the sick and wounded. After the wars, PACU’s and ICU’s were natural extensions of these battlefield inventions. Comment: In the PACU, a patient’s airway, breathing, and circulation are observed, monitored, and treated immediately following surgery. PACU’s decrease post-operative complications. In the ICU, Airway-Breathing-Circulation management perfected in the operating room is extended to critically ill patients who are not undergoing surgery. 1956. THE DISCOVERY OF HALOTHANE, THE FIRST MODERN INHALED ANESTHETIC. British chemist Charles Suckling synthesized the inhaled anesthetic halothane. Halothane had significant advantages over ether because of halothane’s more pleasant odor, higher potency, faster onset, nonflammability, and low toxicity. Halothane gradually replaced older anesthetic vapors, and achieved worldwide acceptance. Comment: Halothane was the forerunner of isoflurane, desflurane, and sevoflurane, our modern inhaled anesthetics. These drugs have faster onset and offset, cause less nausea, and are not explosive like ether. The discovery of halothane changed inhalation anesthesia forever. 1983. THE DISCOVERY OF PULSE OXIMETRY MONITORING. The Nellcor pulse oximeter, co-developed by Stanford anesthesiologist Dr. William New, was the first commercially available device to measure the oxygen saturation in a patient’s bloodstream. The Nellcor pulse oximeter had the unique feature of lowering the audible pitch of the pulse tone as saturation dropped, giving anesthesiologists a warning that their patient’s heart and brain were in danger of low oxygen levels. Comment: The Nellcor changed patient monitoring forever. Oxygen saturation is now monitored before, during, and after surgery. Prior to Nellcor monitoring, the first sign of low oxygen levels was often a cardiac arrest. Following the invention of the Nellcor, oxygen saturation became the fifth vital sign, along with pulse rate, respiratory rate, blood pressure, and temperature. 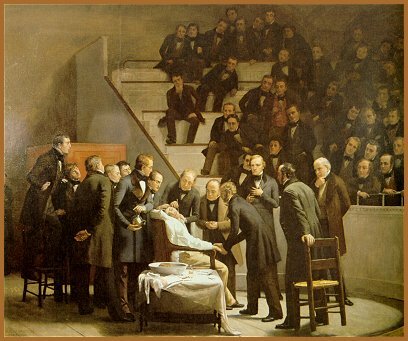 These are the top 11 discoveries in the history of anesthesia as I see them. What will be the next successful invention to advance our specialty? A superior pain-relieving drug? A better inhaled anesthetic? An improved monitor to insure patient safety? Top scientists and physicians worldwide are working this very day to join this list. Good luck to each of them. Posted in ANESTHESIA PATIENT QUESTIONS BLOG, CLINICAL CASES FOR ANESTHESIA PROFESSIONALS.Tagged Anesthesia, anesthesia blog, anesthesia history, anesthesiologist, anesthesiologists, anesthesiology, cocaine spinal, curare, discovery of the endotracheal tube, discovery of the syringe, end-tidal carbon dioxide monitor, ether, future of anesthesia, general anesthesia, halothane, history of anesthesia, ICU, morphine, Nellcor pulse oximeter, PACU, Pentothal, RIchard Novak MD, RIck Novak MD, Surgery, thiopental, top anesthesia discoveries, wartime ICU discovery, wartime PACU discovery. Previous Post HOW RISKY IS A TONSILLECTOMY?